My son’s birthday was a few days after our arrival in Las Vegas and he asked for two things for his birthday: ribs and a scary movie. We booked a table for noon on that Saturday at a new-ish ribs restaurant that was a ten-minute drive from the Strip. 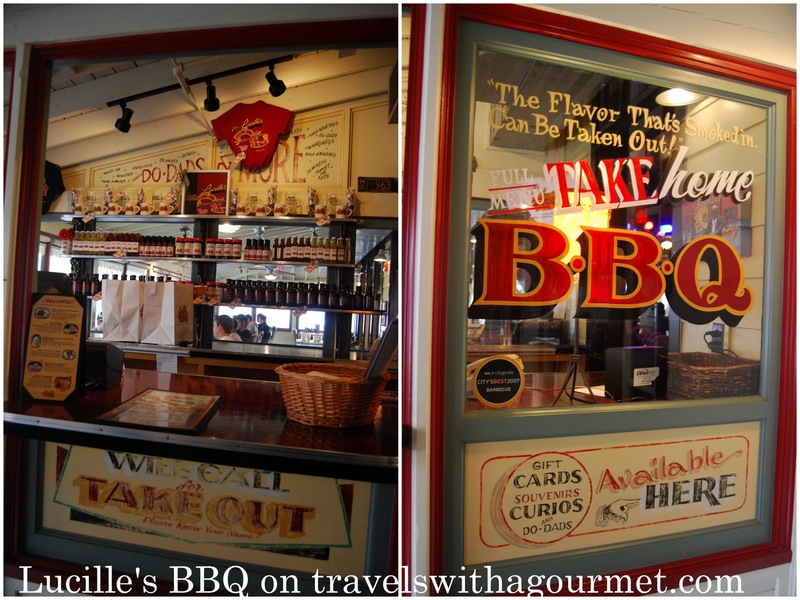 Lucille’s Smokehouse Bar-B-Que is part of a chain. Founded in Long Beach, California by North Carolina native Lucille Buchanan, this chain has grown and now has fourteen locations in three states: California, Arizona and Nevada. The Nevada restaurant is located at the up-market shopping mall, The District, in suburban Henderson. We arrived at noon sharp and waited for the kids to get there before we were seated in their covered front porch area where its’ brighter and much easier for large groups. 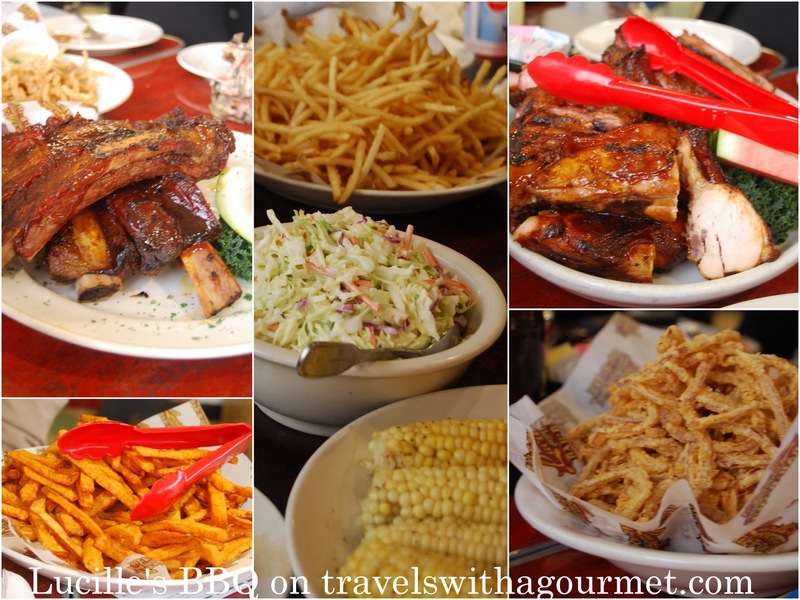 The menu is large and has many different combinations of smoked barbeque – baby back ribs, beef ribs, tri-tip, beef brisket and chicken. After deliberating on how much to order as the portions are very large, we settled on the Backyard Family Feast (US$84.99) which came with two racks of baby back ribs, beef ribs and two half BBQ chickens, plus a choice of four sides: shoestring fries, sweet potato fries, coleslaw and corn on the cob. Along with that, we added a BBQ Rib Appetizer (US$12.99), a smaller portion of just St. Louis pork ribs, hickory-smoked and then grilled. For drinks, we had their sidewalk fresh lemonade which came served in large mason jars. The food was served not long after and indeed, the portions were huge (as the photos attest). The Backyard Family Feast was supposed to serve a family of four but was more than enough for our table of 6 adults and three children. The ribs were good – smoky and spicy sweet from the barbeque sauce. There were also three types of barbeque sauce on the table for those who needed some more: original (sweet and smoky), hot and spicy (original with chili), and Memphis (less sweet and more vinegary than the other two). We somehow polished off all the ribs and were only left with the chicken and a whole load of sides to take back home. We skipped dessert but we did get a small ice cream sundae with a candle for the birthday boy. That evening, we watched Poltergeist which seemed like a really scary movie when we saw it years ago but was not scary enough for our nine-year old. He found the special ghost effects funny instead of terrifying. He did get his two birthday wishes though.